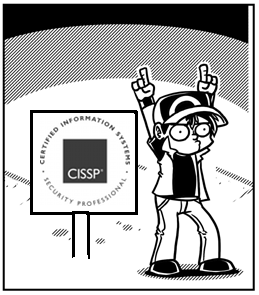 And to think... At the end of 2010 I was ecstatic about achieving CISSP status, after weeks of studying and after a huge exam. I loved the studying and the pressure and of course the fact that I managed to snag a prestigious certificate on my first attempt. Well, the graphic on the left is a variation of my celebratory image of the time. I'm sad to say that I've been slacking off for the past two years, only doing the bare essentials to retain said title. Why? My colleague Rob had it spot on: "It seems like such a huge, daunting task to maintain your CPE." But in retrospect it turns out that he's also right insofar that "it really isn't that much work!". Let's do some math, ISC2 style! In order to maintain your CISSP title, you need to earn a total of 120 CPE in three years' time. As an additional requirement, you must earn 20C CPE every single year, meaning that you can't cram all 120 credits into one year. To confuse things a little, ISC2 refer to group A and group B CPE (which basically differentiates between security work and other work). Now, let's grab a few easily achieved tasks that can quickly earn at least the minimum required CPE. Read Info Security Professional magazine and take the required quiz. 4*2=8 CPE per year. Read one security related book. 5 CPE per year. Subscribe to and read a security magazine. This one is free and submits the CPE for your. 5 CPE per year. Teach a security class at work. 4 CPE. Or 8 CPE if you teach two different classes. Write a security related article of 1-5 pages (or maintain a blog I guess). 5 CPE. That right there is 27 CPE per year, all in group A, which meets the required minimum. it's also 81 CPE out of the required 120 CPE for our three year term. Of the 120 hours, a total of 40 can be achieved through group B, which involves studying other subjects besides IT security. In my case, the most obvious solution for this is self-study or class room education followed for Unix-related subjects. In the next few months I will be studying for my RHCSA certification (and possibly my SCSA re-certfication), which will easily get me the allowed 40 hours. That means I only need to achieve 120 - (81+40) = -1 more CPE through alternative ways :) Additional CPE can be achieved through podcasts, webcasts or by visiting trade shows and seminars. One awesomely easy and interesting way are ISC2 web seminars, which can be followed both realtime and on recordings. Now, because I've been slacking off the past two years, I will need to be smart about my studies and the registration thereof. 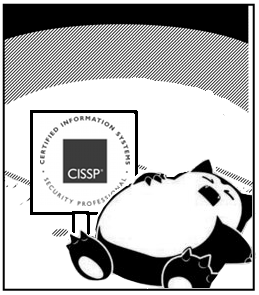 I'm putting together a planning to both maintain my CISSP and to prepare for my RHCSA. It looks like it's a good idea to also renew my ITIL foundations certification. If I'm not mistaken, that can be counted towards group A of CPE, as ITIL is used in domains pertaining to life cycle management, to business continuity and to daily operations. I'll need to ask ISC2 to be sure. Also, many thanks to Jeff Parker for writing a very useful article, pertaining specifically to my plight. Right on! You've been busy :). I hereby give you a free CPE for doing the math ;).